Were there any telegraph lines available in late 19th century Russia (let's say year 1875), which would go deep into mainland Russia? I can find some mentions about Moscow telegraph station being created in 1852 and then extended few times around 1870. I cannot find any specific reports of the lines going between the cities, but I suppose there is a good chance they would follow main railroad routes, especially to St Petersburg (back then capital of Russia). What I'm really interested in are any connections going the other direction - east of Moscow. There was a failed attempt to create America->Moscow telegraph line in 1860's, but it stopped well before reaching mainland Russia. So, in 1875, was there any possibility of sending a message from Moscow or St Petersburg, to Tomsk, for example, faster than utilizing snail mail? Yes, it was possible to send a telegraph message from Moscow or St Petersburg to Tomsk in 1875. Tomsk was connected in 1863, Irkutsk in 1864 and Omsk in or before 1866. If you click on the map above, you can just read that the red lines show "Lines Constructed and in Operation". 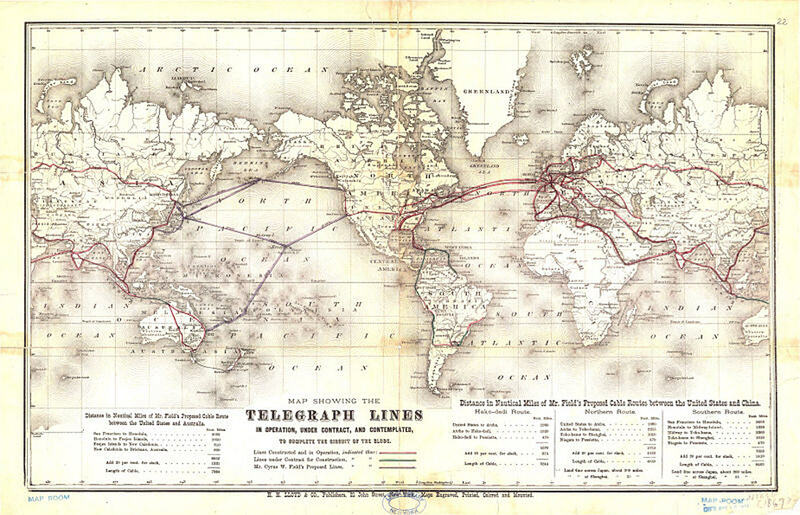 A Danish telegraph company combined a trans-Siberian telegraph line from St Petersburg to Vladivostock with an underwater cable to China and Japan. This long connection was completed in 1871. The Moscow–Tbilisi (Georgia) telegraph line, 2000 km, crossing the Caucasus was established. Baku (Azerbaijan) was connected in 1868 and in 1877 Russia was second only to the US in kilometres of lines. Not the answer you're looking for? Browse other questions tagged russia communication or ask your own question. Isn't there any positive legacy of the Mongolian occupation in Russia? When was slavery abolished in Russia? When did Vladivostok become usable year-round? How educated were the Orthodox priests of Imperial Russia around 1800?